People.com | March 2015 | Ukulele Kids Club Inc.
Bergman and his wife Edda decided to make a fresh start after the tragedy, moving from New York to Miami in 2012. Shortly after, Bergman, now 60, started volunteering at Miami Children’s Hospital and Joe DiMaggio Children’s Hospital. Bergman, who had been playing guitar since he was 11 and has been in a band for many years, would play for patients and their families. He would even let the kids play his guitar, but it was a bit too big for the youngest kids’ small hands. So he decided to try teaching kids the ukulele. Placing it in the hands of one little girl at Joe DiMaggio Children’s Hospital, “it was magical,” Bergman tells PEOPLE. 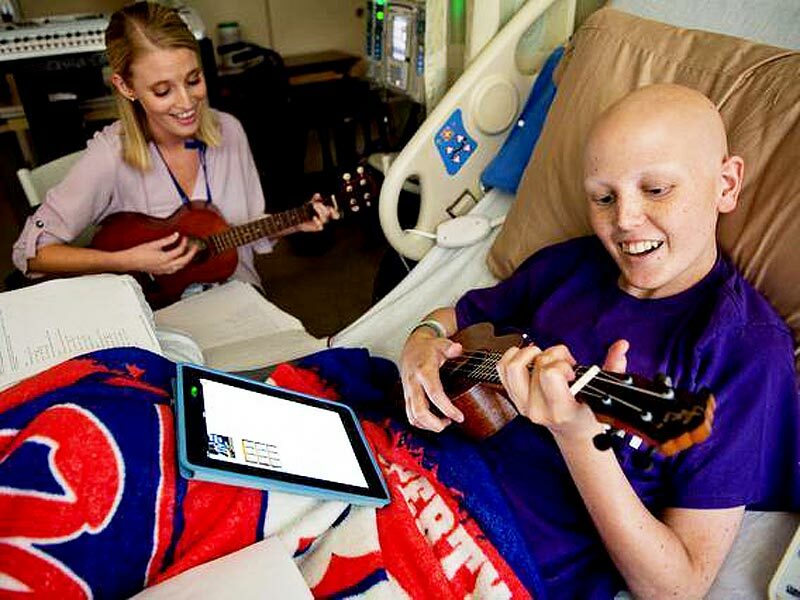 She ended up taking it home, and every time she came into the hospital for repetitive treatments, she would show him her progress in learning how to play the ukulele. In January 2014, he and Edda founded the Ukulele Kids Club, a non-profit that donates ukuleles to children’s hospitals around the country. In all, they have supplied 500 ukuleles to 81 children’s hospitals so far, thanks to donations from musicians. Bergman gets in touch with hospitals’ music therapists and sends them five ukuleles at a time. The therapists then select patients they think would enjoy the instrument and work with them to teach them how to play. The kids sometimes write songs of their own. Stephanie Epstein, 26, a music therapist at Holtz Children’s Hospital at Jackson Memorial in Miami, made up a silly song with her patients about the hospital blues. In the song, they complained about the uncomfortable bed, not being able to sleep when they want and how much the needles hurt. 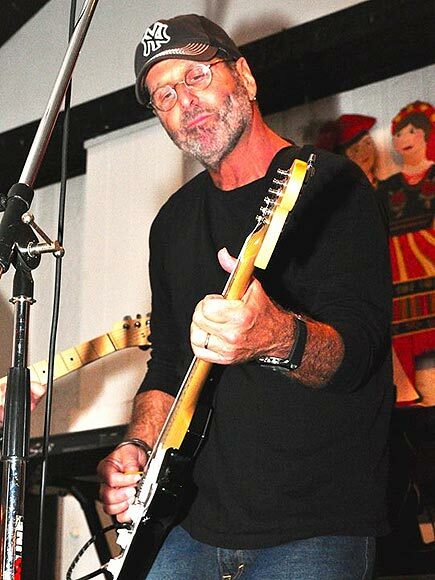 “Song writing can be a really wonderful way to express what they’re feeling in a safe and secure way,” Epstein tells PEOPLE. Her patients can’t get enough of “Let It Go” from Frozen and Taylor Swift songs. “I think I can play Frozen in my sleep,” Epstein says. All of the kids are able to take the instrument home with them. 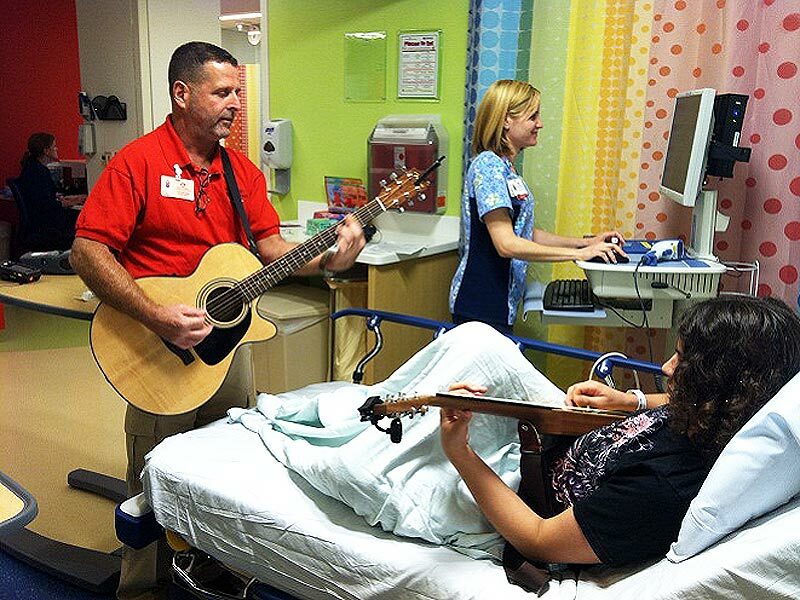 “When I enter a patient’s room, they immediately perk up because it’s the one thing in the hospital that doesn’t have any negative side effects,” Kathleen Humphries, 27, a music therapist at Sutter Children’s Center in Sacramento, California, tells PEOPLE. 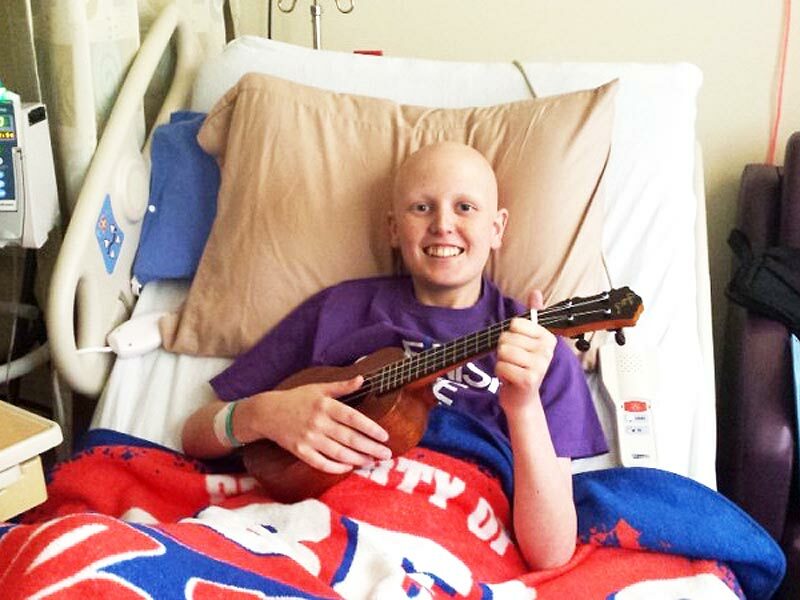 Humphries helped Taylor Andrews, 17, discover his passion for playing the ukulele while he was in and out of the hospital treating his cancer from July 2013 to October 2014 before switching to outpatient chemotherapy. She started off by teaching him his favorite song, “I’m Yours” by Jason Mraz. “It’s an uplifting song so I get happy when I play it,” Taylor tells PEOPLE. Since Taylor was able to bring the ukulele home, his friends now come over and they play music together. “One will grab a guitar, another will grab a ukulele and they just sit around and enjoy themselves,” Dana Andrews, Taylor’s mom, tells PEOPLE. 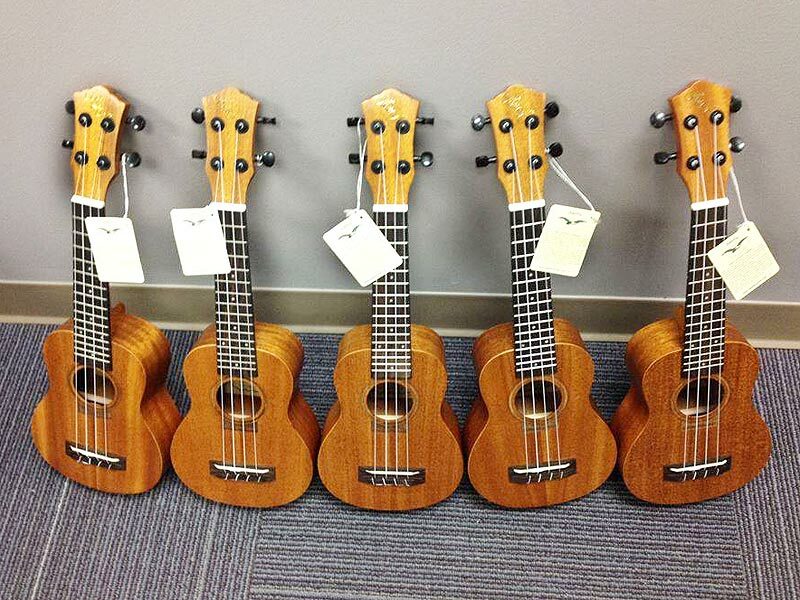 The Ukulele Kids Club hopes to donate a minimum of 1,000 ukuleles in 2015 and bring more music therapists into hospitals.